User Story Tutorial - How to Write Confirmation? Current: User Story Tutorial - How to Write Confirmation? User stories have three critical components often called 3Cs (card, conversation and confirmation). User stories are written on cards. The card does not contain all the information. It is a reminder of what the story is for requirement discovery process. The requirement itself is communicated from end-users to developers through conversation: an exchange of views, scenarios, and operation workflow. The final component of a user story is the acceptance criteria used to confirm that the user story is implemented correctly delivered. It is often thought up during conversations between the project team and end-users. It is best to define the acceptance criteria just-in-time before user stories are distributed in a sprint. User stories should only include the bare minimum amount of information required to enable development and allow testing to proceed with reasonable efficiency. The reason for this is to minimize time spent on anything that doesn't add value to the end product. Confirmation scenario encourages the team to think through how a feature or piece of functionality will work from the perspective of the end-user. Acceptance Criteria removes ambiguity from requirements to avoid surprises at the end of a sprint or release and to ensure customer satisfaction. Developer can create tests based on those criteria that confirm when a work item is working and finalized. You need a project to work on. To avoid messing up your production data, create a new project in Visual Paradigm and name it Online Shop. You can create a new project by selecting Project > New from the application toolbar. Open UeXceler by selecting UeXceler > UeXceler from the application toolbar. Open the User Story page now. 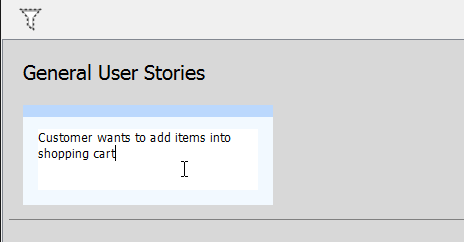 Create a new user story by double clicking on the empty region of the pane and entering the subject of the story: Customer wants to add items into shopping cart. Click on the background of the pane to confirm editing. Let's write the confirmation for the user story we just created. Double click on the user story to open it. Click on the first empty row and start typing the first confirmation item: Add an item to shopping cart (one-off). This means that when the product owner confirm the completion of this user story, he will check if he can successfully add an item to the shopping cart. In other words, developer has to deliver this feature/function when implementing this user story. Click again on the first confirmation item Add an item to shopping cart (one-off). Move the mouse pointer to the right hand side of the item, near the edge of the application window. Then, click on the Add Step button. Enter the first step Open an item page. You may enter the expected result for this step but for this case, since the result is pretty obvious - The item page opened, so we just skip it. Press Enter to proceed to the next step. Enter Select all required attributes as step. Enter Enter quantity '2' as the third step. Enter Click Add to Cart as the step. Let's say we want to emphasize the triggering of command. We can do this by selecting the text Add to Cart and then press Ctrl-B to bold it. There are other formatting options you can find under the UeXceler menu in the application toolbar. Let's describe the result expected by adding an item into shopping cart. 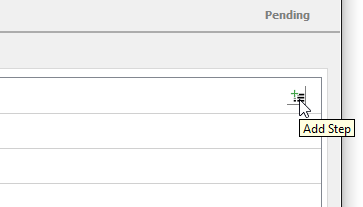 You can press the Tab key to move on to the Expected Result field, or click on the field directly. Then, enter Prompt to add the same item to cart, with the option to select other attributes and a new quantity. Press Enter to move on to the next step. Enter Click Cancel as step text. Bold the word Cancel. Enter Popup dialog box closed as the expected result. As you can see, the Confirmation tab is actually a checklist of confirmation items. On the left of each item, there is a checkbox. When a product owner has confirmed a user story, he/she should place a check mark to the checkbox, indicating the completion of related works. 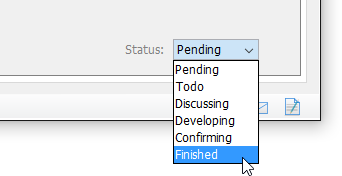 When all the items are checked, and when the user story is in Confirming state (as shown under the Status tab), you will be prompted to set the story to Finished state. If you don't see the prompt you can also set the story to Finished manually by selecting it under the Description page. By making use of the confirmation feature, the acceptance criteria of user stories become transparent to all parties. Both the user and the development team will have a common understanding on what's meant to be 'right'. As a result, the chance of rework is reduced and the quality of work is improved.